Thanks for visiting my online shop! Find what you're looking for yourself or great gifts for your friends. You'll find unique merchandise with my art on t-shirts, sweatshirts, mugs, stickers, and more. This shop continues the great Out to Lunch Cartoon offerings found at OTL1! 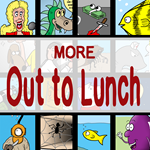 Many of the favorite Out to Lunch Cartoon Animals featured by themselves!